Sobriety is at the center of everything I do in my role a Michigan driver’s license restoration lawyer. For all there is to them, license appeals are really about proving you have quit drinking and are committed to remaining alcohol-free. Alcohol, therefore, is the focus or every workday for me. The other part of my practice – DUI cases – also involves alcohol, in the sense that a person drank too much and then got caught driving. Nowadays, almost every DUI arrest is followed by a court ordering the driver to abstain from drinking for various periods of time, including while on bond and probation. In this article, I want to look at sobriety, and examine the difference between it, and simple abstinence. If there’s one universal truth here, it’s that every sober person is abstinent, but not every abstinent person is sober. In other words, there is more to real sobriety than simply not drinking. To win a driver’s license restoration or clearance case, there are 2 main things you must prove, and do so by what is defined as “clear and convincing evidence.” First, you have to prove that your alcohol problem is “under control,” meaning that you can fix a sobriety date (the date you last drank). The date doesn’t have to be exact; things like “March of 2013,” or “summer of 2011” are okay. Second, and always more important, you must prove that your alcohol problem is “likely to remain under control,” meaning that you are a safe bet to never drink again. This generally requires showing that have both the commitment and the tools to live an alcohol-free lifestyle. Here is where the distinction between simple abstinence and real sobriety becomes clearer. Lots of people quit drinking for a while. Some hope and try to make it permanent, especially if drinking has caused a lot of trouble in the past and they fear even more in the future. It is the threat of trouble – of going to jail, losing one’s job, losing family and/or friends – that is the only real “tool” society has to deter a person from drinking. A Judge cannot tell someone on probation anything like, “if you don’t drink for the next year, I’ll make you happy.” That makes no sense. Instead, the Judge can only threaten punishment, like jail, in the event a person does get caught drinking when he or she is supposed to abstain. It’s the same thing with a frustrated partner or spouse; there is no way to promise happiness to the other party if he or she doesn’t drink. The only thing one partner can do is make clear to the other that he or she will not stand by any longer, and that a return to drinking will damage or even end the relationship. Thus, as a society, pretty much all we can do to someone whose relationship to alcohol has grown problematic is to try and scare him or her out of drinking. Sometimes it works, to varying degrees and for various lengths of time. That’s abstinence. However, if the ONLY reason a person stops drinking is because he or she is afraid of the consequences, then all that can go out the window the moment he or she perceives those consequences as remote or unlikely to happen. People who are merely abstinent (as opposed to genuinely sober) will not drink when the fear of the consequences of drinking is greater than the desire to drink. By contrast, when we talk about sobriety, we are talking about not having any kind desire to drink, or, in a sense, having a desire to NOT drink. The “merely abstinent” knows that things can get bad when he or she drinks, and will therefore abstain as long as those consequences seem likely. Make those consequences go away, and the fear goes with it, leaving only the desire to drink. Without a counter-balance, the person will pick up again. This is way different than sobriety. Sobriety, by contrast, arises when the desire to drink is curbed, or otherwise goes away. When a person gets sober, he or she first accepts, as an almost universal truth, that he or she cannot ever safely drink again without at least opening the door to trouble. What’s different, though, is that the person isn’t so much afraid of drinking as he or she learns to really enjoy life without alcohol. Assume, for example, that Tipsy Tina is on probation for her 3rd DUI and is tested regularly enough that she is committed to not drinking until it’s over. Because she has not given any real thought to quitting for good, the only thing she’s changed in her life is that she won’t consume alcohol for the time being. She still goes to the same parties and hangs out with the same friends, often serving as the designated driver when they go out to bars and such. Tina knows exactly when she’s getting off probation, and has big plans to go out and celebrate as soon as that happens. Tina isn’t sober. She’s abstinent, but nothing in her life has changed (especially her whole mindset and outlook) except that she’s afraid to drink for the time being. As of now, Sam has been sober for just over 2 years. He went to counseling and did AA as required by the Judge, and learned a lot there, but didn’t feel the need to keep going to meetings, and has done just fine without them. He did, however, cut ties with all his drinking buddies. It was somewhat hard and lonely to not drink at first. Sam wondered if he’d ever have fun again. Bit by bit, though, he began to fill in his time with other things to do. After a while, he regained the trust and respect of his family and those who matter to him. He has a smaller but better circle of real friends now. He feels much better physically and emotionally. He has been promoted at work. He isn’t blowing his money like before, so he has been able to improve his standard of living. He’s also started to do more with his time than sit around drinking and BS-ing all night with the same group of drunks. It’s not like he started making custom furniture or gotten into some crazy-busy hobby, but he has started to enjoy different TV series on Netflix, and looks forward to coming home at the end of the day. His life is full. He looks back and wonders how he found all that time to drink, and he could have ever thought he was truly having fun back then. And drinking certainly was not fun toward the end, either. Sam is not only abstinent, he’s sober, as well. He’s happy. It’s not that he never thinks of having a drink, but such thoughts pass quickly and are hardly any kind of temptation to him. He likes who he’s become. In the real world, people manage to stay sober a million different ways. Some individuals become very involved in things like their work, or a sport, or a church, or rescuing dogs; you name it, I’ve seen it. Other people are more relaxed and less structured about it. Some people enjoy AA, but many do not. Some people just want to take it easy, and there’s nothing wrong with being a homebody. Not everyone wants a new hobby or a whole new social circle. Some people just want to come home and surf the internet or play video games, or just plain relax. The distinguishing feature of real sobriety is simply that the person is happy not drinking. Offered the chance to drink again, they’d say no, not just because they fear getting in trouble, but because they like their lives now, without alcohol. They like themselves. They’re happy. 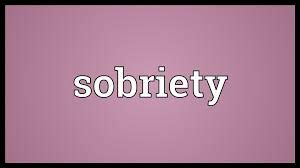 Sobriety brings a sense of happiness (some might say serenity) that is levels above mere abstinence. As I noted at the outset, everyone who is sober is also abstinent, but not every abstinent person is really sober. And for everything there is to this, if you’re sober, you just “get” this. Sobriety is not just a phase, or a lifestyle choice; it’s a state of being. Sober people think differently, and are profoundly grateful for the chance to be sober in the first place. An abstinent person won’t look back on the his or her first day without alcohol and think, “That was the best decision I ever made.” A sober person will do just that, and then usually credit every good thing that has happened since then to that decision. Sometimes, a person may decide to abstain from drinking just to comply with court orders, or to satisfy the demands of others, and then begins to find that his or her life is getting better without alcohol, and thereafter decides to not go back to drinking. Although most sober people have a distinct “hitting bottom” moment, some people reach a tipping point where the decision to not drink again is more gradual. Who cares; however it happens, it happens, and whatever works, works. Although these gradual decision cases aren’t as common as the more emotionally charged “light bulb moments” most people experience, they are just as real, and just as life changing. In the final analysis, when you ask a truly sober person why he or she doesn’t drink, they’ll tell you all about the good things that have happened before they ever talk about the bad things that could. Ask the same question of someone who is abstinent, although not really “sober,” and you’ll get a laundry list of negative consequences they want to avoid and that outweigh any perceived joy drinking might bring in the short term. You don’t need to be an expert to figure this out once you know what to look for. If you have really quit drinking for good, that’s awesome. If you’re not sure about all this “sobriety” stuff, maybe I can help you go from abstinent all the way to sober. I’m always glad to speak with anyone who needs a little inspiration in that regard, even if they’re not ready to start the license appeal process. If you need to win either the restoration of your Michigan driver’s license or the clearance of a Michigan hold on your driving record, I can do that, guaranteed. All of my consultations are confidential, free, and done over the phone, right when you call. You can reach my office Monday through Friday, from 8:30 a.m. until 5:00 p.m. (EST) at 586-465-1980. We’re here to help.